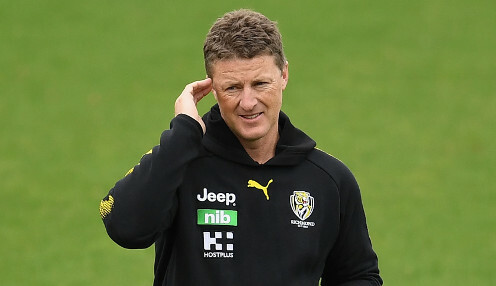 Richmond coach Damien Hardwick praised small forward Shai Bolton after his three goals in the JLT Community Series victory over Essendon. The 19-year-old Tiger, who played six games last season, had a starring role in the game in Wangarratta as he helped the club to an 87-point win. Premiership star Daniel Rioli's set to miss the start of the season through injury, so Bolton's display puts him in pole position for round one selection. As well as his goals, it was Bolton's defensive pressure that impressed Hardwick. He was part of a small forward line that harassed Essendon defenders into repeated turnovers. The coach said he was looking to fill Rioli's role with someone who could bring the pressure every week. Speaking of Bolton, Hardwick said: "It was certainly a step forward. It was one of the better games he's played for us, based on those factors that we look for and it's really exciting for us. "He's a kid with enormous talent and he's got a lot of areas in his game to continue to improve. But he's incredibly young as well." Richmond won the contested ball 127-115 and pleased Hardwick with their enthusiasm. But they lost ruckman Toby Nankervis to concussion early in the game after his head hit the turf at Norm Minns Oval, with defender David Astbury also suffering a head knock. Meanwhile GWS have learned youngster Will Setterfield will miss the entire season. The second-year midfielder ruptured his ACL in a practice match against Sydney on Friday at Henson Park. He will undergo a traditional knee reconstruction after the Giants confirmed the news. Head of athletic performance David Joyce said, "This is a disappointing setback for Will, who hadn't put a foot wrong through the pre-season. We'll consult with the surgeon in the coming days before mapping out a suitable rehabilitation program for Will." Greater Western Sydney are 1212/1 to win the Grand Final. The Giants are 1/1 to win their first game of the season against Western Bulldogs, who are 1/1.